Last week there was an interesting discussion on Regina Hackett’s blog about a perceived lack of commitment to Northwest art among the major Seattle museums. She mentions the Bellevue Arts Museum as an exception. I just went to BAM for the first time yesterday, and I would have to agree. Nestled among the stacks of corporate condos and suburban big-box mall stores comprising downtown Bellevue, the Bellevue Arts Museum is an oasis of culture and calm. A thoughtful three-story building designed by Steven Holl, the museum’s mission is to be “the Pacific Northwest’s center for the exploration of art, craft and design through exhibition, educational programs and partnerships, emphasizing the work of regional artists.” Of the four exhibitions currently on view, three are solo shows by local artists: John Grade, Etsuko Ichikawa and Tip Toland. All three are worth the cost of admission. Disclaimer: Grade and Ichikawa both show at Davidson Galleries, the fine establishment I happen to collect paychecks from. I made the trip to BAM specifically to see their shows because I think they are both excellent artists. John Grade. Collector, 2007. 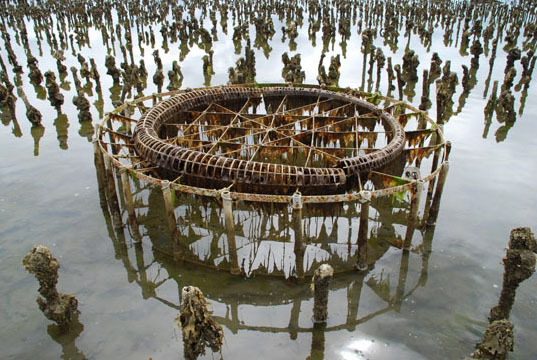 Documentation shot of wooden sculptures after collecting debris from under Willapa Bay, WA. John Grade is a one-man force of nature. Interested in the relationship between natural and man-made processes, Grade’s current series of sculptures are designed to be installed in natural environments where they accumulate debris, erode and decay. The exhibition at BAM includes several sculptures and installations in various stages of cosmic collaboration along with beautifully presented photographs documenting the artist’s process. Etsuko Ichikawa. From Deai series, 2004-2008. Glass pyrograph on paper. A Seattleite by way of Tokyo, Etsuko Ichikawa’s work with the Pilchuck Glass School and the Tacoma Museum of Glass established her as an important figure in the Northwest glass scene. 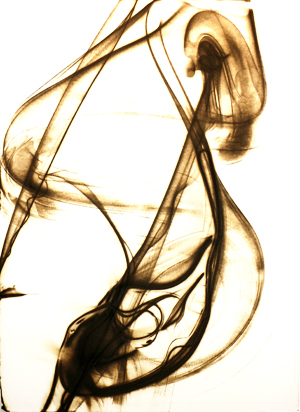 Her current series of glass pyrographs—smoky and elusive drawings made by tracing molten glass along a sheet of paper as it cools—reflect the artist’s interest in the transformation from the ephemeral to the eternal. Tip Toland. Milk for the Butter Thief (detail), 2008. Stoneware, paint, pastel and wool. 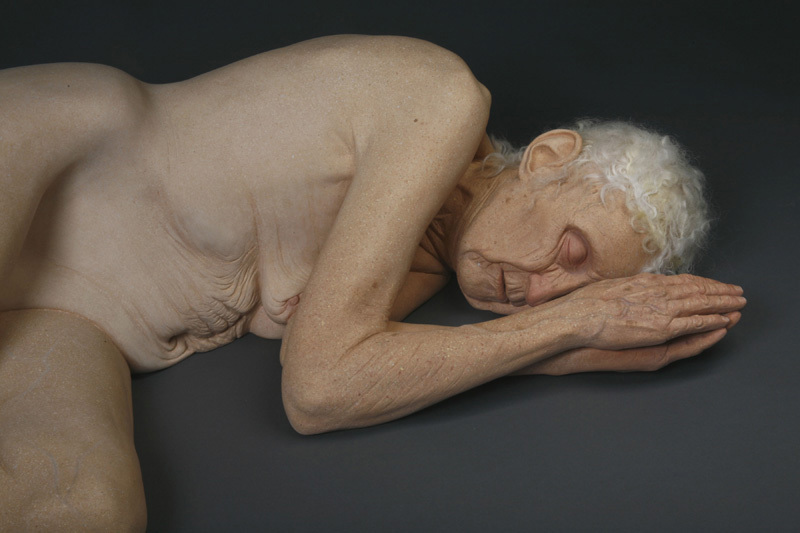 An amazingly skilled ceramicist, Tip Toland sculpts children and elderly figures with an uncanny level of detail, frailty, and illumination. According to her résumé, Toland has taken advantage of many of the best opportunities available to local artists. She has recieved a GAP grant, an Artist Trust Fellowship Award, and was nominated for a Neddy. There is a complete review by Regina of the Toland show here. In order to bloom here, I think NW art is going to have to do some major soul searching. There really hasn’t been anything that could be called NW art since the fabled NW school. Maybe NW art needs to stop trying to be NY art and just be itself. I think this is a decent point. Seattle is a far cry from San Francisco, let alone New York. We’re more isolated up here than we like to pretend, and when I take the time to pay attention to what the Northwest has to offer, I can rejoice in this fact. We’re kind of at the edge of “civilization” up here, perhaps more than any other major American city. In spite of this—or perhaps because of it—many of my artist friends have already moved to New York, and many more are dying to. The perceived lack of support for their work here has got to be a factor. Regina Hackett made the point that it should be a priority of local museums and institutions to help Seattle artists “bloom where [they’re] planted without losing sight of the larger world.” It’s encouraging to see artists like John Grade, Etsuko Ichikawa and Tip Toland take full advantage of the unique history, landscape and opportunities of our little corner of the world and make passionate, beautiful objects that revel in their own context. Kudos to the Bellevue Arts Museum for their commitment to this kind of programming, and to Regina for her tireless championing of Northwest art. John Grade: Disintegration Through Landscape is on view at BAM through November 30, 2008. Tip Toland: Melt, The Figure in Clay runs through February 8, 2009. Etsuko Ichikawa: Traces of the Molten State is up until March 8, 2009. ~ by emilypothast on November 3, 2008.